Andrew Tani, Founder & CEO of Andrew Tani & Co talks about Penara, one of the top investment opportunities in Indonesia. Penara is the brand name that was coined by the Chairperson of the Muslimat Nahdlatul Ulama (MNU), Ibu Khofifah Indar Parawansa. Penara is short for two Indonesian words that literally mean “Indonesian woman.” Penara refers to an aggregated market having to do with the fact that the MNU is a Muslim women's organization that has existed since 1932. Penara was launched in Bandung, West Java only last 18 June 2016. They number more than 20 million women, and they are very well organized. Across the country, they have more than 33,000 offices with 20 million female volunteers. The organization has received, and continues to receive, annual support from the donor agencies. The world wants to see the religious organizations in Indonesia to be well-managed and well-organized, because separatism in Indonesia is controlled due to the presence of these unified, humongous religious organizations. The largest Muslim organization, Nahdlatul Ulama, has 90 million members. Six factions, moderate Muslims who are creating their own way of Islam, which is peaceful and loving. It is difficult for the outside world to understand that, because all we see are the small pockets of militant groups, but their number is few compared to these huge groups. We facilitated a workshop for MNU, and the workshop came up with a strategy. In order to be sustainable, they need to reduce their dependence on grants from the donor agencies. They needed to have their own economic activity that would generate funds for their operations. They are a volunteer organization, so while nobody gets paid a salary, there are still hundreds of thousands of kindergartens, clinics, thousands of hospitals and prayer centers that are organized under that organization's umbrella. Now the vision of the Chairperson was that we need to have economic activities. In order to do that, we need to get our Muslim women to become economically independent. The first five years of our plan was focused on developing spiritua and physical health. The second five years is for Indonesian women to gain economic independence, and that is where we are now. Within these five years, we organized a market aggregator company called Netindo Utama Mandiri, jointly owned with the MNU, and deployed what we call Digital Business Ecosystem Partnership. 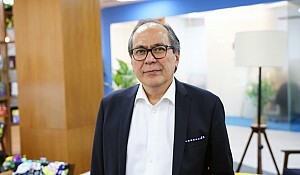 The founding partners who have signed up already are a USD 7 billion telco, the largest in Indonesia and the 6th largest in the world, and BULOG (read logistics bureau), the sole government agency held responsible to monitor and remedy supply and demand conditions for prime commodities such as rice, sugar, cooking oil and beef with the end in view of keepig price at optimum levels through market operations. We are in the process of signing up a bank to provide our members with banking services. The collaboration calls for Netindo Utama Mandiri to convince Indonesian women to sign up as Penara Members, become subscribers of the Telco ’s e-money service to enable payments using the cell phone as registered customers of our Kiosk Penara, where they can buy prime commodites and a host of other household and life needs at reduced prices. We recruit and supply our Kiosk Penara with the Penara product mix. Penara members will also receive offers for banking services at better terms negotiated by Netindo Utama Mandiri. The Chairperson of the Muslimat Nahdlatul Ulama today happens to be the Minister of Social Affairs of the government of Indonesia. She graciously accepted our invitation to deliver a speech which really encouraged all the members of Penara, including the telco who were present and our other partners, that what we are doing has immense socio-economic value. Since the launch of Penara last 18 June 2016, about 5 weeks ago, we have registered over 2.000 members and 17 Kiosk Penara. If one wants to be part of developing the socio-economic aspect of Indonesian life, Netindo Utama Mandiri is waiting for more partners for whatever else you can do for this large group of Muslim women on a missio to help their families and collectively help the nation to experience sustainable economic development. If we can help the Penara members, their families will all be helped. We can reach out to the families and make them even more productive, first by getting prime commodities at the best prices. This country needs the socio-economic support from the rest of the world. We are a global community, and what is good for Indonesia will be good for the world.